I am one of those that absolutely loves Christmas. It is the most fun time of year and I love all the hustle and bustle that goes with it, but I don't like being crazy stressed. Gift Giving: I always start a little early and try to find a few presents as the year unfolds that I think people will like. That is all well and good, but if I buy things too early then I forget where I put them, or I wind up with a mess like I have here in the corner of my guest bedroom. For guys, I have some shirts that I put in a sack by size, so I know what I have for each person. An assortment of placemats and chargers for ladies on my list and I love adding napkins to go with these, so that will go on my shopping list. I also need one more set of placemats. An assortment of candles, candle holders, memo pads for stocking stuffers. I also have a really pretty silver tray and a wood and marble chopping board. You can see another really cute peacock belt wallet and a really fun mink ball key chain. I think I have the girls just about taken care of. For that hard to buy for man on my list, I found a gorgeous silver and ebony duck hanger and shoe horn. I always feel good when I get the hardest person on my list taken care of. Now that I know what I have left to buy for everyone on my list, I can concentrate on just those few things and have all my shopping done before Thanksgiving. Just a few things to add for the adults and then I can have fun shopping for toys for the grands. Recycle What You Can - I have a lot of paper left over from previous years, so I think I will use these same ones and do a gold, black and white theme. I also have a few black and white gift boxes, so those could be added to the mix if I just coordinate all my ribbons. Maybe shop for some black, gold and white pretty grosgrain ribbon. Plenty of pretty tissue and gift bags here too. So I need to use some of this up before I buy anything else. I think a trip to the $1 store for some boxes for shirts and pants will get me started. I hate to wrap gifts, so getting that done early is a real plus for me. We have a really large landing at the top of the stairs, so I put a small 4ft. work table at the top of the stairs so I could set up a wrapping station. There is plenty of room to walk around it so it isn't in the way and I can wrap a few presents at a time and then have that chore all done. The table is big enough to hold all my assorted tissues, ribbons, tape and scissors. I have a variety of paper on the floor underneath and boxes and a bag for trash on the side. Perfect. Since the loft is right beside the table, perfect place to stash the presents that I have wrapped. They're not in the way and part of this dreaded chore is done. 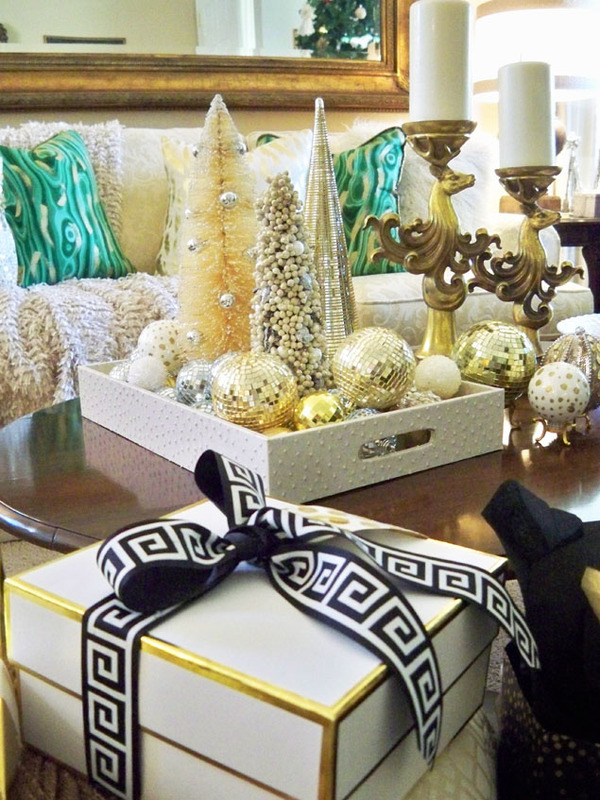 With the papers I had on hand and the gift bags I already had, I was able to stick to a gold-black and white theme. TIP: Take a look at previous Christmas pictures to remember how you decorated in the past. Then use those same items in a totally different arrangement this year. Or if you are really pressed for time, just do the same thing again, it will only create fond memories of the past and you won't have to recreate the wheel. Let The Baking Begin It is time to get a ton of baking done before Thanksgiving and Christmas. 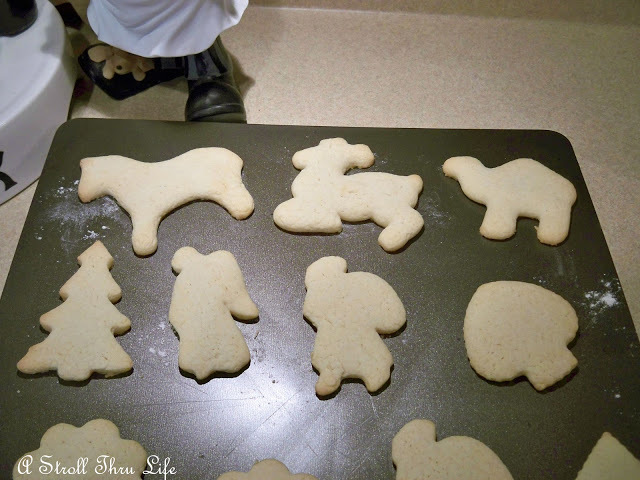 Make a bazillion cookies, breads and candies now and put them all in the freezer. 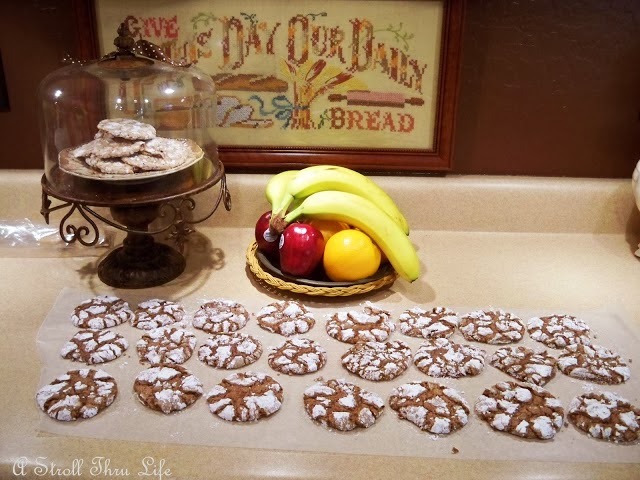 You will be thrilled when all you have to do is place them on a pretty tray. Since we have one week after Thanksgiving until the lst of December, I know most of us are really going to be in a pinch to get all the decorating up in a hurry. Maybe some of your decorating can begin before Thanksgiving, then put up the tree and go all out when Thanksgiving is over. So plan now while you have a little free time and then just sit back and enjoy. 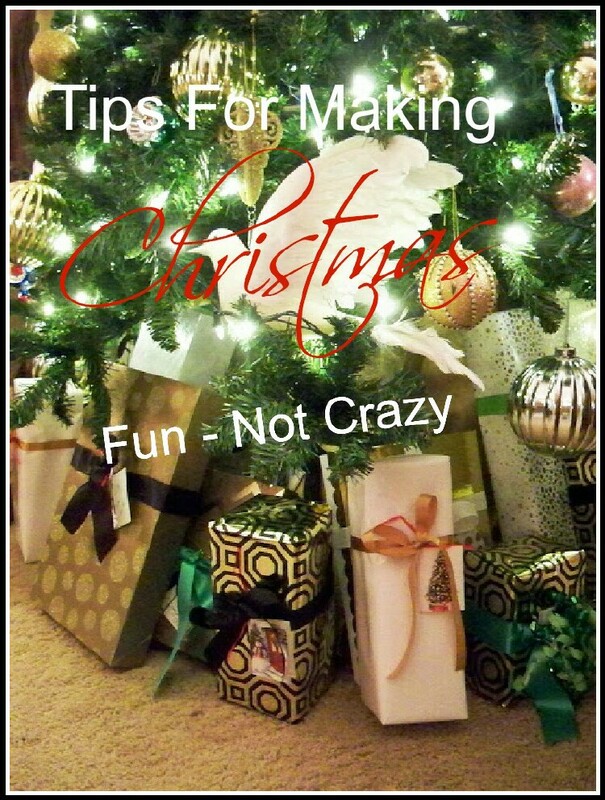 Miss Marty this post was chock full of great tips! I just need to get through this weekend and then I am taking two weeks off to decorate, wrap and stock up so that I can truly enjoy all that the holiday season has to offer. Marty- I don't know if I am happy for this info or mad that you are so far ahead of me! lol Those are all really great tips. My biggest 'search' is to always find pairs of matching pjs for all the grandkids. WE give those out on Christmas Eve and then the kids wear them all day on Christmas Day as we open gifts and take pictures--it is so cute!!! Marty I sure hope your family doesn't read this blog post or there won't be any surprises on Christmas, ha ha!! I did take the time to organize my gift wrap station just recently - it had been dismantled when my older daughter moved back home to make room for storage, but since she's out on her own again it's back! I love having everything I need to wrap gifts right in one spot, with a long counter that's perfect for that task. It's not in the prettiest spot in the house (downstairs laundry area) but it does the trick! Love all the tips! I am lucky in that I don't have to worry about it. I stopped giving presents some years ago. Family decision. Great 'tips Marty. Buying gifts all during the year is a great stress reliever! 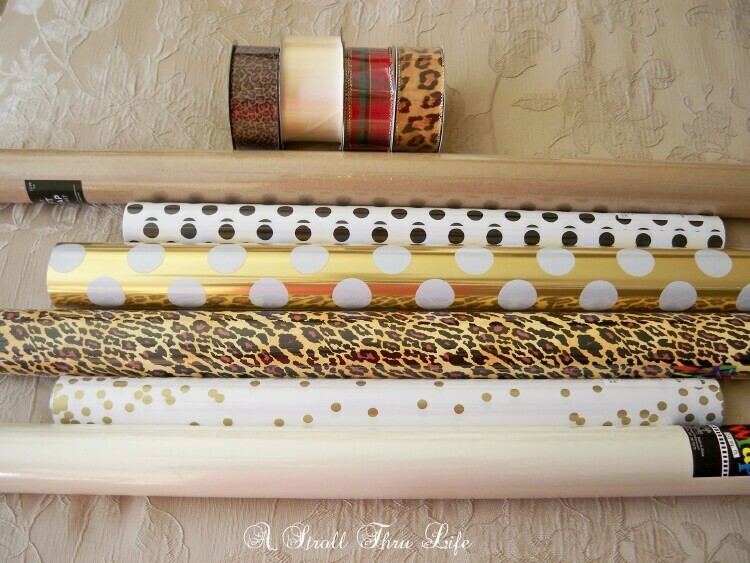 Could you please tell me which store carries the leopard paper? It is wonderful. You are so clever, Marty, and I gleaned a lot of ideas from this post. I don't have space for a wrapping table, but I do keep all of my wrapping paper in a tall basket, and all of the tape, ribbon, scissors, tags, etc, in a shoe box. It's so easy to bring this to my kitchen peninsula when I need to wrap. Then it goes to a little corner in my den. You are so organized and so many wonderful tips. I get a big box and as I purchase gifts, I put them in there. I wish that I would wrap when I get home from buying, but I am so tired that is gets put into the bx. Then it's crazy time to get them wrapped and shipped. I normally go up to my son's for Christmas, so I have to get it in the mail. Thanks so much for these wonderful tips. I will try and use them. Have a great weekend and I bet your loving the cooler weather, I know that I am. Great tips!! I hope to have a super organized Christmas this year and yes, it is time to wrap the presents. I made all the gifts this year!! A goal I have been wanting to do for years and have never followed through. Would love to know where you found the belt wallets. They would be perfect for my granddaughter. Thanks. Great organization. Thanks for sharing at Home Sweet Home. Marty, you amaze me. You're so organized, and I appreciate your sharing these tips: you've inspired me!